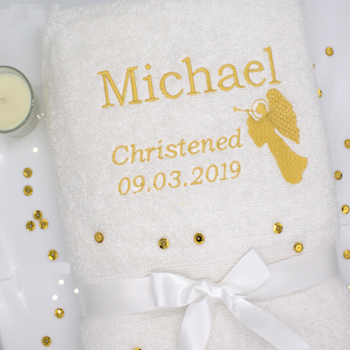 Baptism towel embroidered with an angel and a personalised name or brief message making a special gift for a Christening, Baptism or Wedding. Baptism towel embroidered with an angel and a personalised name or brief message making a special gift for a Christening, Baptism or Wedding. Fill in the option boxes with the text you want and choose what colour embroidery thread you would like and what font style for the lettering. The towel is white bath size cotton towel 75x125cm custom embroidered to one end. Baptism towel embroidered with an angel and a personalised name or brief message making a special gift for a Christening, Baptism or Wedding. Fill in the option boxes with the text you want and choose what colour embroidery thread you would like and what font style for the lettering. The towel is white bath size cotton towel 75x125cm custom embroidered to one end. A lovely gift for all ages to celebrate a Christening, Baptism or special occasion. Please allow 48 hours for personalised orders to be dispatched as they are made to order by Amys Gifts.